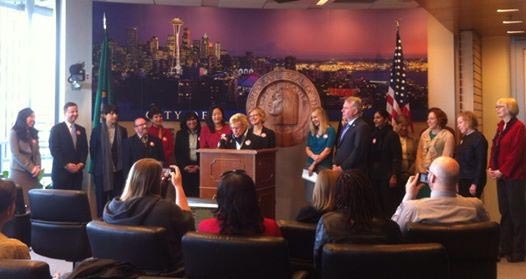 On Wednesday, Seattle’s mayor and City Council committed to bringing Seattle closer to gender equity. Mayor Ed Murray and Councilmember Jean Godden announced practical first steps, based on recommendations of the Gender Equity in Pay Task Force. In a joint resolution, the mayor and council pledged to address disparity both in city government and across the region, including by identifying strategies to establish a paid parental leave policy for City employees, implementing other gender-parity and family-friendly policies along with training and outreach to all departments, supporting statewide legislation for Paid Sick and Safe Leave and Family and Medical Leave Insurance, and launching a regional Gender Equity Initiative. A year ago, a study by the National Partnership for Women and Families found that the Seattle metropolitan area has the biggest gender wage gap in the country. Across the region, a woman working full time earns just $0.73 for every $1.00 earned by a man. When the City of Seattle conducted its own internal analysis, it found that even within city government a 9.5% wage gap exists. Former Mayor Mike McGinn formed the Gender Equity in Pay Task Force in response. I was proud to serve on that task force, along with an amazing, diverse group. Our recommendations were designed to make the City a model employer and an agent for change in the broader community. They are also only a starting point. Achieving equal pay for women isn’t just about the same pay for the same job. Most of the disparity inside City government – like much of it in the private sector – is because jobs are so segregated by gender. Structures that devalue women’s work and care giving are deeply embedded in our culture and economy. We won’t change them over night, or without controversy and resistance. Janet Chung from Legal Voice and I both spoke on behalf of the Task Force after Mayor Murray and Councilmember Godden accepted our report and announced their joint resolution. We pledged to continue working with them – and maybe sometimes prodding them – over the next four years. Janet noted that Boston’s mayor has already set a goal of becoming the first city to eliminate the gender gap. She challenged all employers in Seattle to work with the City to make Seattle the first city with gender wage equity. Dismantling practices and structures that determine worth according to gender and gender identity and building new ones that allow all of us and our families to flourish won’t be easy, but it can be done. 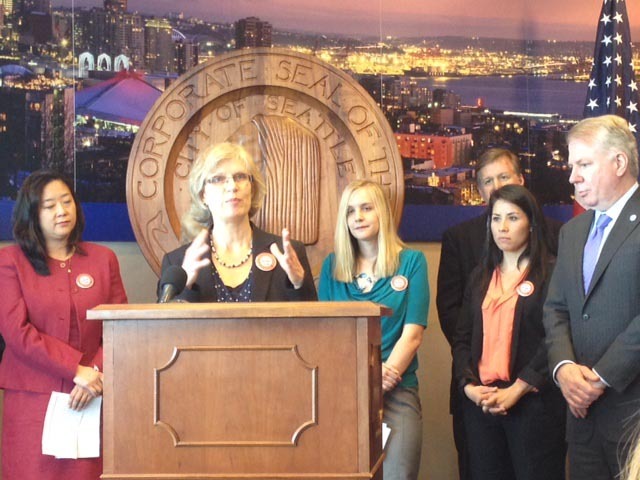 Together, we can work with our city leaders to push Seattle forward and set the national bar for equal pay practices. Read the Gender Equity in Pay at the City of Seattle report by the Gender Equity in Pay Task Force and the City Council’s joint resolution with the Mayor to learn more.